The average Democrat voter – Joe Sixpack as he is sometimes called – may be excused for his confusion this year. On the one hand, he has been asked by First Selectwoman of Westport Dianne Farrell to rally to her cause because her opponent in the race for the U.S. Senate, Chris Shays, is a war hawk; on the other hand, Farrell herself has endorsed the candidacy of current U.S. Sen. Joe Lieberman, who is -- a war hawk. "Joe is a longtime friend,” Farrell has said, “and he has endorsed me and my campaign in the past. We'll have to agree to disagree on the war . . . but we agree on so many other issues," women's privacy rights, the Family Leave Act and fair wages among them. Lieberman has come under fierce criticism from party activists for adopting a position on the Iraq war that seems to them supportive of President George Bush’s Mid-East policies, and yet Farrell has accepted an endorsement from the leper, hoping to escape the leprosy. Can she embrace the Lieberman without catching the dreaded disease? Behind every thunderclap and lightning stroke lies the peace that passes understanding. In the meantime, adding insult to injury, Shay's was fulsome in his praise of Lieberman during an interview in the Stamford Advocate. Soon after, rumor was set afoot that the Republicans had planned to cross-endorse Lieberman. According to a report in The Hartford Courant, Shays had contacted Governor Jodi Rell a month ago and discussed the possiblility of a cross-endorsement. Rell was "nonplussed." That rumor was hotly denied by Republican honchos, causing "Yeah, sure" grins to appear on the faces of political commentators. Some rumors cover the truth, others cover deft political strategies and others cover belly laughs. No one is certain about this one. Lieberman was cross-endorsed once before by Democrats and a Potemkin party Lowell Weicker formed to back his run for governor. At that time, Lieberman accepted the endorsement. This time, the senator has said "Thanks, but no thanks." Any endorsement by Republicans would simply demonstrate that the state party is moribund. Many Republican watchers have long suspected that it is stiff with rigor mortis. What comes after a speedy withdrawal of troops from Iraq -- a measure favored by Cindy Sheehan and zanies on the left – is the whirlwind. 2) The Bush plan: the introduction into Iraq of democracy. The Bushies think that if democracy can be transplanted to Arabia and if the tender shoot takes – a big "if" – the plant may spread to Syria and Iran. Democracy, an invasive plant, is non-aggressive, or at least less aggressive than militant Islam. 3) The ostrich option: bury your head in the sands of Arabia, cross your fingers and hope for the best. Immediate withdrawal, al la Vietnam, leaves all our allies, overt and covert, perched on the roof, waving to the helicopters that will take them to the next safe haven. But the next haven will not be safe for long. Mahmoud Ahmadinejad, the democratically elected president of Iran, longs for the return of the Mahdi and thinks he sees his figure approaching in the smoke and ashes of Israel. The Bush plan, according to the father of the modern conservative movement, Bill Buckley, is not working. The ostrich option provides only temporary relief. We cannot go back. All the bridges have been burned on 9/11. Dodd and Lieberman at least attempted an answer to the question here. 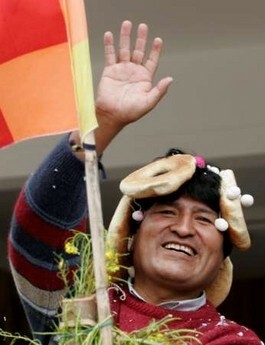 1) What are those things on Evo Morales’ head? 2) Will Fidel Castro ever die? 3) What’s up with democracy these days? Both Morales, the president of Bolivia, and Hugo Chavez, the president of Venezuela, were democratically elected, as was President Mahmoud Ahmadinejad of Iran, who some rightists have compared to Adolph Hitler – who, by the way, also was democratically elected. Is this the sort of thing that President Bush, democratically elected twice, wants to spread about the world like dragon’s teeth? 1) The decorative headpiece is made, in part, of bagels. 2) Like most tyrants, Castro probably will die in his bed of advanced old age. Some blame his longevity on the CIA, an organization that seems incapable of making a lethal exploding cigar. 3) Can’t answer that one. Part of it is stupidity. Part of it is traceable to the allure of socialism, a doctrine that holds that everything needful may be appropriated from the hated upper classes. That notion had its longest run in the Soviet Union, until the enterprise collapsed of its own internal contradictions at the turn of the century. President Ronald Reagan, Pope John Paul, Lech Walesa, Alexander Solzhenitsyn, and leaks in the concrete dikes surrounding the Soviet castle all conspired to end nearly a century of tyranny. Sustaining liberty involves some heavy lifting. Perhaps the exercise has exhausted the West. The whole gang was there at the Carpenters Union Hall in Hartford's South End to wish Sen. Joe Lieberman a happy 64th birthday and to banish the ghost that for nearly a month had been haunting the Democrat Party. The ghost’s name is Ned Lamont, a Greenwich millionaire, anti-war enthusiast and possible primary opponent. The differences between the two senators, as it turned out, were slight. Both agreed that the United States had entered the war on faulty premises, largely owing to bad intelligence and false assumptions. Weapons of mass destruction – what Aristotle might have called the proximate cause of the war – were nowhere to be found. Some have suggested that Iraqi chemical weapons had been shuttled off to Syria prior to the invasion. Others have suggested that Saddam Hussein was intent on deceiving the United Nations, Iraq’s traditional enemy Iran, and pretty nearly everyone else into thinking that he was able to dispose of weapons of mass destruction. Unfortunately for him, the ruse proved successful. When the U.S. military pried Saddam from his spider hole several years ago, he was packing no nuclear or chemical weapons, and it is not likely that questions concerning WMD’s will be answered during Saddam’s public trial. Saddam’s defense team, which includes former U.S. Attorney General Ramsay Clark, a weathered anti-Vietnam war veteran and defender of anti-American tyrants everywhere, have managed to turn the trial into a litigatory slugfest reminiscent of the New Haven Black Panther spectacles of the silly seventies. The Dodd/Lieberman Iraq War “debate” – It was really a press conference in which both senators were asked questions submitted by reporters Shelly Sindland of Fox News and David Lightman of the Hartford Courant -- allowed both senators to strut their solidarity at a moment when Lieberman’s position on the war has been vigorously attacked by anti-war opponents in Connecticut’s Democrat Party. While Dodd acknowledged he would not have voted to approve the war had he known there were no weapons of mass destruction when he cast his vote, the senator thought an immediate withdrawal of troops would be foolhardy. He seemed during the debate to be as ardent for victory in Iraq as Lieberman or, derivatively, President George Bush, a position not likely to stand him in good stead with those in his party who want to throw Lieberman on the ash heap of history. Meanwhile, back on the Democratic ranch, Lieberman was roping early endorsements from the shakers and movers gathering at the Carpenter’s Union Hall. Here as elsewhere, there were disagreements over the senator’s position on the Iraq war, but those differences were not determinative. Dodd said he did not think disagreement on the issue of the war should “justify the kind of effort, expense and cost to divide a candidacy and party. I don't think that makes a lot of sense." And even the master of ceremonies, Rep. John Larson, the only member of Connecticut’s congressional delegation to have voted for an amendment requiring the administration to develop a withdrawl plan for Iraq, did not press the issue on this occasion. Larson represents Manchester and Windsor, two towns that formally censured Lieberman for his position on the war. The line of division within the Democratic Party runs between those who wish to press a point – that a political price should be attached to Lieberman’s support of Bush’s Iraq policy – and those who wish to win an election. Arch liberals in the party are willing to press the point by supporting a primary waged by Ned Lamont. But the governing class, one eye cocked on Gov. Jodi Rell’s astounding approval ratings, is fearful that party divisions can only hurt other politicians who in the coming general election will share a party line with Lieberman. Most polls show Lieberman drawing support from Republicans, and many Democrats wish to take advantage of Lieberman’s popularity within the opposition party --which is why virtually every prominent Democrat whose name will appear on a voting line during the next election was present at the Carpenter’s Union Hall to disagree politely with Lieberman’s solidarity with Bush on the Iraq war while pledging to support his candidacy. The first rule of politics is: If you cannot win, you cannot rule. It gets "curiouser and curiouser," as Alice said in Wonderland. Mayor John DeStefano of New Haven, one of two Democrat gubernatorial hopefuls, is taunting Gov. Jodi Rell with “being more concerned about George Bush’s politics than about the needs of families in Connecticut.” How so? Hugo Chavez, the duly elected president of Venezuela, has made DeStefano an offer he couldn’t refuse. Here’s the deal: Venezuelan oil companies controlled by Chavez will sell oil at a reduced price to an American distributor; the distributor – Citizens Energy, a corporation controlled by former U.S. Rep. Joseph Kennedy II of Boston, Massachusetts – will sell the oil at market prices, thus realizing a profit, the difference between the market and purchase price; the profit then will be shuttled to the poor in Connecticut through 12 private non-profit agencies that administer the state’s energy assistance program. The ball, as the political prognosticators like to say, has now been batted by the governor into Blumenthal’s court. Sure, Chavez is a larval Castroite who, somewhere down the road, may be troublesome for U.S. foreign policy in Latin America. And sure, Chavez is likely to outlast the Bush administration; Latin American dictators, be they leftists or rightists, usually die in their beds with smiles on their faces, never mind the havoc they have caused. And sure, people hung up with morals and ethics might pause just a bit before they consider doing business with socialists who suppress political opposition and inevitably fall into the nasty habit of nationalizing all private – i.e. non-government controlled – enterprises, including churches and newspapers. But, if acquiring oil at a lesser price from dictators is legal, the governor said, why not give it a spin? Spoken like a true blue-blooded Republican businesswoman. A moral reluctance to do business with tyrants is an emotion bluenecks in Connecticut have come to associate with the left -- remember Pinochet. Except in this case, it isn’t, because the tyrant is a man of the left. If Castro had proposed early on in his career to ease the lot of the poor in Connecticut by furnishing through a distributor Cuban cigars at a lesser price than is usually paid by millionaires in Greenwich, the difference to be passed on to the poor, would DeStefano have accused those who doubted the propriety of the arrangement of being more concerned with political matters than the lot of the oppressed? What’s going on here is politics as usual, with an unusual twist. DeStefano wants to be governor. To set his foot on the rung of the latter that leads upwards to heaven, he must first vanquish in a primary his Democrat opponent, Stamford Mayor Dannel Malloy. Castro, after attaining totalitarian powers, would simply have shot Malloy; or he might have packed him away in the Cuban gulag for thirty years. But we live in a democracy, and the vanquishing must be done democratically, which means that DeStefano must round up in the primary a plurality of votes from party activists by priming their ideological pumps. How better to pump up loyalists than by putting Rell between a rock and a hard place? The rock is Bush, who tends to view as menacing colorful characters such as Chavez and Evo Morales, the duly elected President of Bolivia who has vowed to be a colossal pain in the neck to the imperialistic and capitalistic USA. Morales has not yet been introduced to DeStefano. The hard place is Chavez’s offer: Do we really want to see the poor and destitute freeze? New England winters are at least as harsh and unforgiving as Bush. Rell has attempted to slip the noose by draping it around Blumenthal’s neck and suggesting that if Chavezian socialism is okay with Connecticut’s mayors and the attorney general, it’s okay with her. The whole thing easily could backfire: Might not Chavez be supplying pro-socialists like DeStefano the rope that voters in Connecticut, many of whom are incurable capitalists, will use to hang him? A report early in February from Chris Cillizza, the Washington Post’s political blogger, disclosed that Sen. John McCain, big media’s favorite moderate Republican, will be in Connecticut on March 17 to raise funds for Governor Jodi Rell’s campaign. Just in time too. Some Democrats were beginning to wonder whether Rell, whose continually high approval rating has astonished both friend and foe, had become “a party of one.” She had successfully defied the expected Republican position on stem cell research and other hot button Republican issues, proving that there is a little McCain in all of us yearning to bust out. Cooption of the kind practiced by the usual Connecticut Republican moderate is intended to anesthetize the opposition. Given Rell’s stratospheric approval rating, some Democrats are asking, does she need McCain to raise funds for her? Or is it possible that McCain, bitten with presidential aspirations, could use a boost from Rell? Perhaps McCain’s March appearance may be mutually beneficial. Conservative Republicans who once viewed McCain with a jaundiced eye have suddenly become kinder and gentler towards the sometimes prickly senator. If in the future McCain shares his own and Bush’s mailing list with Rell, the governor, hot to stamp out corrupt campaign financing practices, need not worry that her own reelection effort will be underfinanced. The notorious Abramoff scandal in Washington DC also has given a boost to McCain’s presidential stock. Not only is McCain viewed as a rough and ready Republican independent, the senator also is one of the authors and boosters of the McCain/Feingold bill, a piece of legislation that is supposed to put the kibosh on political corruption. Of course, every upside has its downside, and there are some ungagged First Amendment enthusiasts about who view the bill as a menace to free speech. Representative Chris Shays, known as “McCain Lite” in Connecticut, is one of the sponsors of the cognate bill in the House, Shays/Meehan. In having McCain stump for her, Rell will fall into none of the ideological traps that have ensnared the hapless Sen. Joe Lieberman, now put in the doghouse by Democrats who tend their party’s progressive flame. Lieberman’s fraternization with President Bush on the Iraq war – and, even more so, the fatal kiss bestowed on Lieberman by a besieged president – have opened the door to a primary threat the turncoat senator certainly would have wished to avoid. Unsurprisingly, the sharing of campaign contributors lists is not prohibited by legislation that has found favor with incumbent reformers like McCain, Feingold, Shays and Meehan – and for good reasons. The sharing of such resources is a practice frowned upon by good government types but frequently indulged in by professional politicians. The kinds of challengers whooping it up against Lieberman, moneyless agitators concerned with maintaining doctrinal purity, usually do not have access to such riches. And because such lists give a preternatural advantage to incumbents, the governing class is not likely to prohibit them when it writes campaign reform legislation. Put it this way: If you were an incumbent politician fleeing a house set afire by campaign finance reform agitators, what would you save from the house first: a list of political contacts, a rolodex of friendly reporters, or your campaign finance contributors records? As a practiced politician, wise in the ways of world, would you rather stroke the keepers of the flame, Democrat or Republican Party purists who fear their parties are going to Hell in a hand basket, or keepers of the lists, powerful incumbent politicians like McCain, Feingold, Shays, Meehan or Rell who can provide you with cash flow? No longer a neophyte in petty coats, Rell has grown up and attained her full potential: She has now become an honest to goodness, 24 karate gold plated professional politician, like John McCain. The short answer to your question, Virginia, is: Yes, there is a Democratic Party here in Connecticut. There are at least two, possibly as many as three or four in-state Democratic Parties. The Republican Party, as you may know, is little more than a Potemkin village governed by village idiots. As both political parties shed their substance and become more moderate, they assume a ghostly shape and become mere shadows of what they once were. It was not always so. Every so often, one finds a person who possesses what used to be called an institutional memory. Nowadays we call such people “party activists,” and they are especially energetic during primaries. But wait … I see I shall have to explain what a primary is. I think you have a rudimentary notion of what a political party is: It’s a political organization centered in a body of ideas designed to elect people to office. Primaries were supposed to wrest from party bosses decision making powers concerning what people shall occupy political positions and confer that responsibility on rank and file party members. Primaries move decision making from smoke filled political conventions to rank and file voters. Before primaries, we had just one general election, and voters decided between nominees selected by convention delegates. Primaries inserted yet another election between conventions and the general election. The Democrat nominee for governor this year will be determined in a primary election. The Republican nominee will be the incumbent governor. Primaries, some people believe, give an advantage to comfortably situated incumbents, because challengers must expend oodles of money and time convincing rank and file party members to select them to run against the opposing party’s nominee. In the meantime, while the two primary opponents are attacking each other -- or, more commonly, presenting their ideas to party activists in a sort of mock election, making sweet faces at each other and using the primary jointly to attack the nominee of the opposing party -- the incumbent is gathering money and laying plans to blow up the hastily constructed platform of the primary winner. Moreover, since the primary winner is determined by activists who tend to be more extreme than run of the mill voters, the primary candidates tend to construct their messages accordingly, giving an advantage to their opponents who, in the following general election, use deconstructed primary platform planks to bludgeon the primary winner. After the primary bloodletting has abated, the primary winner drifts again to the middle in an attempt to convince voters in the general election of his poise and moderation, at the considerable risk of opening himself to charges of hypocrisy. It is this ideological arc joining together the primary and general election that convinces the majority of voters that politics is a conspiracy of dunces. Got all that? Good. Now you are ready to vote, Virginia. Excuse me? Oh dear, no – I would never dream of telling you who to vote for; that is positively un-American, unless, of course, I were a politician, or a pollster – whose political predilections may be deduced from the shape and thrust of my polls – or a political commentator, or the CEO of some hydra-headed political interest group. You will have to determine for yourself whether there is any significant difference between the two Democrat gubernatorial contestants this year, Mayor Dannel Malloy of Stamford and Mayor John DeStefano of New Haven, and vote accordingly. Recently, Malloy was able to distinguish himself slightly from DeStefano by embracing a notion propounded by Rell that the estate tax, which the incumbent governor proposed to phase out, is a drag on new business development. This year, politicians of all stripes will be anxious to attract new businesses to a state that, recent reports indicate, is dead last in economic growth. Malloy also has outlined a plan that supports government partnerships with faith based and non-profit organizations, which may sound to skittish Democrats suspiciously like a similar plan offered by President George Bush. The idea behind Bush's plan is to widen the precints of politics so as to include the many private social agencies -- even churches -- that give the poor and destitude a leg up. 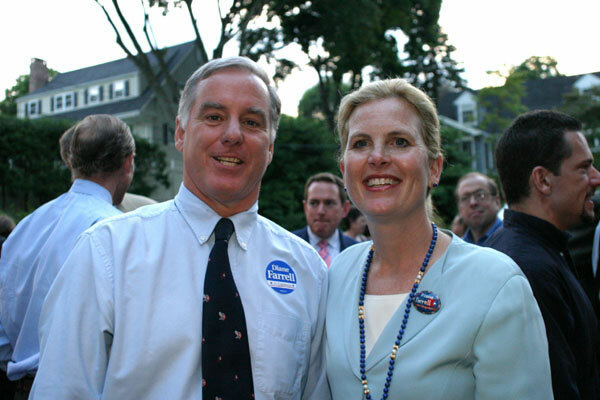 These proposals may alienate the sort of Democrat activists who favor a primary between Ned Lamont, an anti-war Greenwich millionaire, and Sen. Joe Lieberman, an incumbent recently put on ice by party activists for having supported many of Bush’s initiatives in the Iraq war. Nothing, one expects, will ever be simple for ex-Governor John Rowland again. He came home from prison in Loretto, Pennsylvania to caterwauling and cat calling. Most of the current spitballs have been launched at him by folk who regularly rail against people for having fallen short of Christian precepts. McEnroe himself, fresh from moderating a literary discussion at the Bushnell between Jan Weiner, Kurt Vonnegut and Joyce Carol Oates, led the charge by reproducing a letter written by Rowland interlined with McEnroe’s own comments in bold type. In his distress, three people friendly with the ex-governor – his wife Patty, fellow radio talk show host Brad Davis and Will Marotti, pastor of the non-denominational New Life Church in Meriden – gave support to Rowland while he was in jail. Apparently no one who violates the strictures concerning remorse and redemption laid down by Rowland’s arch critics is to escape whipping. Or maybe, just maybe, Rowland might have been saved from commentary that borders on anti-Catholicism had he reverted to Buddhism rather than Evangelicalism. Anti-Catholicism is all the rage among the smart set these days; that and a preference for esoteric, unstructured belief systems. We may leave it to McEnroe, a one time religious reporter for the Hartford Courant and a devout Unitarian, to establish the precise connection between a lust for hot tubs and the religion of St. Augustine and St. Thomas Aquinas. Maybe, just maybe, there is a tenuous connection somewhere. And if there is, McEnroe certainly is clever enough to sniff it out. Amazing what a Yale education and a little knowledge can do for you. More likely, Rowland fell from Catholicism before he fell into Loretto. The wilder and more dangerous supposition is that suffering sometimes does lead to genuine remorse, the proof of which is always in the pudding. Politicians who have fallen from high estate can be remorseful and repentant. Even King Lear was remorseful. An exposure to wretchedness sometimes is curative, when it does not kill the soul. In this way, the distracted and hardhearted may “feel what wretches feel.” The superflux is the overflow of wealth, health and happiness that, people suppose, is the lot of the rich. Rowland is no Lear, to be sure. But McEnroe is no Fool either. How quickly things change. Only a month ago, Democrat leaders in the state House and Senate seemed willing to go to the wall to defend a provision they had inserted into a Clean Contracting Bill favorable to unions. The provision required the state to perform cost benefit analyses before soliciting bids for private service contracts. Opponents of the provision insisted it would make private contracts more expensive and less desirable, but the provision was aggressively backed by state unions and their in-pocket legislators. Governor Rell vetoed the bill twice and vowed to veto it roughly forever if the offending provision was not removed. Shortly after Rell had smuggled into her State of the State address a nifty and apparently popular idea, the elimination of property taxes on cars, leading Democrats in the House and Senate decided to jettison from the Clean Contracting Bill the provision that made Rell’s spine stiffen. According to both Rell and Democrat leaders in the House and Senate, rank and file Republican legislators were not advised concerning the governor’s February surprise; neither were rank and file Democrat legislators advised concerning their leader’s abandonment of the provision that had occasioned Rell’s two previous vetoes. In a little more than a month, Democrats had pirouetted on their non-negotiable demand. The Democrat leader of the Senate, Donald Williams, suggested it should surprise no one that unions would be willing to give up an advantage to assure clean contracting. After all, why should anyone suppose that patriotic unions would not favor clean contracting? Williams stopped short of suggesting that unions might settle the agonizing problem of high and punishing property taxes by agreeing to a ten percent cut in wages that might then be returned to hard pressed taxpayers to alleviate their crushing property tax burdens. The union-friendly provision may have been a throw-away measure or, in political lingo, a bargaining chip. We are now told by the Democrat leadership that unions were not distressed when the provision they had lobbied for was yanked from the bill; unions are not always mercilessly self interested, and they too stand to benefit from honest brokering in state contracts. If the measure was a bargaining chip, what did the chip buy from Rell? What high stakes poker game is being played here, and who’s dealing the cards? It’s possible that Democrats are surrendering one offensive position in order to regroup behind another more advantageous position. The elimination of the property tax on cars puts a serious wrinkle in the Democrat’s election year script. That script – like some Hollywood movies, years in the making – has Democrats coming to the aid of hard pressed property tax payers by shifting tax collections from municipalities to the state. The state will increase the amount of money it sends to municipalities by a few percentage points, raising the state’s burden for the cost of education to a previously agreed upon ceiling, thus providing “property tax relief” to townsfolk across the state. The “relief,” however, is contingent upon equivalent reductions in town taxes. If the state assumes 10% more of the cost of education currently paid by municipalities, townsfolk will realize relief – if, and only if, the municipalities reduce taxes by an equivalent percentage. In fact, the so-called “tax savings” is simply charged to a different payer. Town taxpayers also pay state taxes and they will not realize a tax savings unless spending, at some point in the tax chain, is reduced. The Democrat plan is long on suggestion; a10 percent assumption of taxes on the part of the state does not necessarily mean a tax reduction. But the plan always has been short on particulars. Show me the money, says the cynic; show me the real tax savings in the plan. Democrats started to play this pea and walnut game way back when Bill Curry, in his gubernatorial campaign, was warning us that then Governor John Rowland was a crook. When Rell proposed to eliminate the property tax on cars, she threw a bean bag at the Democrat’s election year script. Democrats are now insisting, as always, that a real tax cut must be “paid for” by equivalent tax payments. Rell may not “cut” the car tax unless she provides additional tax dollars to off set the cut. In other words, the Democrats are prepared, as always, to frustrate any real tax cuts. The real purpose of a real tax cut is to create a temporary deficit that will be “paid for” through cuts in spending. “Rell Calls For Boldness,” the headline screamed. As if anticipating the governor’s bold measures, an exuberant Jim Amann, the Democrat Speaker of the House, pre-announced a Democrat spending plan – That is what a budget is – that was, well … bold as bold can be. Amann put his finger on what he considers to be the solution to one of the problems mentioned in several reports that had analyzed Connecticut’s anemic economy -- traffic problems. The Speaker proposed to spend an immodest $6.2 billion to fund road, rail, bus and highway improvements, especially along that nettlesome stretch of road – I 94, better known as the Fairfield County clot -- that runs from Bridgeport through the state’s “Gold Coast” and into New York. In days of yore, Former Gov. William O’Neill rammed through the legislature a $6.5 billion plan following the collapse of the Mianus River Bridge in Greenwich. Amann has invited everyone in the state to be at least as courageous. True, the Speaker’s budget is more than twice as large as the last pre-income tax O’Neill budget, but who’s counting dollars? "If we cannot do what Gov. O'Neill did, then shame on us," said the Speaker. The measly $1.3 billion plan produced by the legislature last year, Amann said, was the result of timid legislators who were fearful of the reaction to such a plan as he was proposing. “You know what?” said the Speaker, “Let me tell you here. Throw me out of office. Throw me out of office if the idea of [spending the amount he proposed] to resolve our transportation problem is a bad idea." Rell’s more modest proposal, Amann said, “is chicken feed for the over all problem we have.” Rell’s predecessor, Rowland the felonious Republican, “basically didn’t want to do squat,” but Amman magnanimously gave Rell credit for “starting a dialogue.” Whenever Democrats have in the past started dialogues with Republican governors, the chat has proven to be expensive for people who, having contributed to a government that has gobbled up twice the amount of money spent by the legislature during the golden days of Bill O’Neill, are now feeling the pinch. Not that anyone is counting dollars, but the last pre-income tax O’Neill budget was $7.5 billion, which is nearly the amount Amann and the Democrats propose to spend on transport systems in the next ten years. In her budget address, Rell extended a hand of friendship to those penny pinchers in her party who see a connection between high taxes and the reluctance of businesses to locate in a state that has become top-heavy with rapacious legislators – an actual tax cut. Previous governors, including Rowland, have been content with tax rebates. Shoppers in Connecticut shrewd enough to understand the difference between real price cuts in goods and a fake sale that promises rebates will understand the difference between the two. Unsurprisingly, businesses considering moving in or out of state likewise understand the difference between tax rebates and tax cuts. A state that cuts taxes is serious about controlling spending. Not only has Rell proposed a gradual phase out of the estate tax; boldly going where no man has gone before, she has proposed to eliminate the property tax on cars, which pretty much caused state legislators, the majority of whom are Democrats, to gag on their silver spoons. Much of the choking is purely political. Democrats live in the hope they will be able to persuade pinched taxpayers that they are the party of tax relief. Their pitch has centered on property tax relief. The state government is supposed to relieve hard pressed taxpayers of a portion of their property burden by assuming a larger portion of tax payments for education. The shift in a small percentage of payments from municipal to state government will provide real relief only under certain conditions: The municipalities must reduce property taxes by a commensurate amount; taxes spent by municipalities for other purposes must not increase; and the shift in payments from municipalities to state government must be accompanied by progressive rates that shift payments from the middle class to, as progressive Democrats might put it, those who can more fairly pay the tax. That would be the millionaires. When some Danish editors decided to sponsor a contest among cartoonists to see which of them was courageous enough to publish under their own name in a local paper cartoons featuring the prophet Mohammed, several cartoonists jumped at the chance and burned their fingers on Islamic hotspots all over the world. Earlier in Amsterdam, the artist Theo van Gogh, was murdered by a Muslim who took offense at a film he had made that, in the opinion of his knife wielding critic, was demeaning to Muslim women. It didn’t work out exactly this way. The ferocity of the Muslim response had people in the West scratching their noggins and wondering at it all. Wonder, says the philosopher, is the beginning of wisdom. One thinks of the modest response here in the United States to ritualistic flag burning and the Andres Serrano art show in New York. Fundamentalist Christians and Catholics were mightily upset by Serrano’s Piss Christ, which featured a crucifix submerged in the artist’s urine. Even then, cognoscenti in the art world were wondering what all the fuss was about. It was just art. On the other hand, the philistines did not burned down museums. Before Islam reacted to the cartoons, there had been gentle hints in some newspapers that the desecration of religious things could lead to what we in the West might consider an exaggerated response among some Muslims. A false story that jailers in Guantanamo Bay, Cuba had flushed Islamic holy books down toilets had caused a backlash that resulted in the usual blood and gore. The cartoonists and their editors, assuming they read newspapers, ought to have taken these early warnings as a hint that the use of Mohammed in a cartoon would lead to arson and bloodshed. It’s difficult to imagine a happy ending in all this for the West. Once again, the West has shown itself to be the boorish elephant in a room full of religious nick-knacks. An Egyptian journalist noted in one of his columns that the impiety of picturing Mohammed in any fashion – although the prophet has been represented in Persian art many times – is an offense far less serious than the slaughter of innocents by Islamic heretics. "Who hurts Islam more” wrote the journalist, “a foreigner who excels in depicting the Prophet, or a Muslim with an explosive belt who blows himself up at a wedding party?" That fellow was promptly fired by editors who did not want to see their building in flames when they returned to work in the morning. The Danish cartoonists are all in hiding; so much for courage. The United States will find it more difficult to persuade moderates in the Islamic world that exposure to Western ideas will not instantly transform them into liberated Satanists. And, finally, such stupidities till the cultural ground and prepare it for terrorists and enemies of the West, like the charming president of Iran who, following the Cartoon flapdoodle, has invited Western cartoonist to submit their work to Hamshahri, one of the largest newspapers in Iran. The paper is running a contest centering on the theme, dear to Mahmoud Ahmadinejad, that the Holocaust was a Jewish hoax. "Does the West extend freedom of expression to the crimes committed by the United States and Israel, or an event such as the Holocaust?” Hamshahri asked editorially. “Or is its freedom only for insulting religious sanctities?" On a level playing field, Hamahahri and Ahmadinejad probably would go down to dusty defeat. 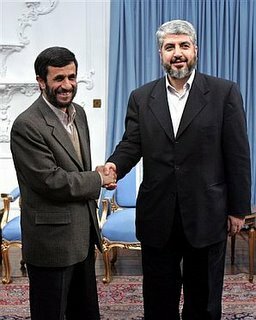 The notions, widely peddled in the Middle East, that the Holocaust is a Jewish fiction and that the slaughter of Islamites by other Islamites is a virtue rather than a heretical sin heartily condemned by the prophet Mohammed would be pitifully easy to disprove, had not the cartoonists pitched the ground against the West. Not all things lawful, said the prophet Paul, are advisable. It will take more than a brute assertion of rights to win to the side of the West people in the Middle East who must be weary of burnings, beheadings and a heretical righteousness that robs pious Islamic mothers of their children and Islam of its rightful future. Like the Civil War, President Bush’s No Child Left Behind Act has set brother against brother. Not in several lifetimes would anyone have expected Connecticut’s Attorney General Richard Blumenthal and Scott Esdaile, president of the state chapter of the NAACP, to be peering at each other over the political barricades. And yet, here we are. Blumenthal brought suit against U.S. Secretary of Education Margaret Spellings because the attorney general thought the Act imposed on Connecticut mandates that were not funded by the federal government. Governor Jodi Rell nodded consent to the suit, which also was backed by teachers, municipal governments and other custodians of the status quo. The status quo in Connecticut’s cities should be unbearable for minorities, because the state’s urban centers are encrusted with schools that by any academic measure are spectacular failures. As it turns out, it is unbearable for the NAACP, an organization that views the No Child Left Behind Act as a useful inducement to non-performing schools. And here the NAACP bumps heads with Blumenthal. It is not that Blumenthal and Rell wish to sit idly by while generation after generation of African Americans have been written off by educators, teachers unions, their confederates in the state legislature, and two thirds of the state’s boards of education that have joined Blumenthal in his suit. Not at all. The thrust of the attorney general’s suit is highly conservative. Education is a function of state government, and if the federal government wishes to poke its nose into matters that should not concern it, common decency requires that the feds should pay for the burdens the No Child Left Behind Act imposes on the state. The U.S. Education Secretary, whose department conservatives once sought to abolish, dared to quibble with this view of things and pointed out that the federal government is a co-contributor in the miss-education of Connecticut’s urban school children. As such, the federal government has a stake in seeing to it they are suitably educated. The No Child Left Behind Act is a pistol pointed at the heads of those who ought to be held responsible for failing public schools. It says in so many words: Shape up, or we’ll close down your non-performing schools. Taxpayer dollars should not be spent in supporting failing public schools. Enter Blumenthal on his usual white horse, waving a suit in his clenched fist. Choruses of teachers in the background, acting like third graders faced with a difficult homework assignment, sing their usual plaint, “It’s too hard! It’s much too hard! I caaaaan’t do it!” A half century after the educational establishment had systematically destroyed a comprehensive curriculum centered on basic skills, stuffed children’s heads with powder puff subjects and diverted massive funding increases into the pockets of teachers, suddenly everyone discovered it was virtually impossible to induce urban eighth graders to read and figure and write, so that someday they might be able to mount their chargers and put to right social wrongs -- like Blumenthal. John Brittain, one of the prime movers in the Sheff v O’Neill suit, is one of the faces that will be staring at Blumenthal across the legal divide. Blumenthal’s suit should be dismissed without merit for two reasons, Brittain said: It is a waste of time and resources; and Blumenthal’s claim that the sanctions embedded in the No Child Left Behind Act represent an unfunded mandate is amusingly irrelevant. “The 1964 Civil Rights Act,” Brittain points out, “was an unfunded mandate.” Legislative and judicial remedies, Blumenthal should understand – if only from his own experience – can be expensive. But expense in the pursuit of justice is no vice. As usual, the political struggle that fuels the dispute will be played out in court. It should be played out in the legislature. And if the Republican Party were worth a lick of salt, it would support the No Child Left Behind Act, join forces with the NAACP and Brittain, and get the job done.